Holkham National Nature Reserve01328 711183 work Nature ReserveWindswept tidelines, a maze of creeks and saltings, miles of dunes and sandspits, shady pinewoods, green pastures and marshes: the mix of habitats and the blend of wildlife make Holkham NNR a unique place, somewhere to catch your breath in a busy world. 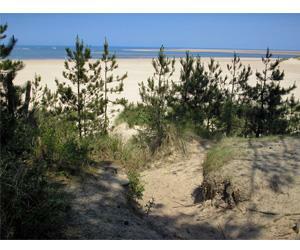 Holkham National Nature Reserve stretches from Burnham Norton to Morston and covers about 4,000 hectares. It is possible to explore most of the area by following footpaths from the main settlements or from car parks. The core section of the reserve, from Wells to Holkham Bay, is crisscrossed by paths allowing access to all the best wildlife habitats. Please stay on the agreed access routes. Please do not walk on the farmland or grazing marshes (which form much of the reserve), or to the marked breeding colonies on the beach in the summer. To the east of Wells, the Norfolk coast footpath runs parallel to a large area of saltmarsh and mudflats which is dissected by a number of tidal creeks. These are dangerous on a rising tide and this area should not be walked over without detailed local knowledge. Please keep dogs on a lead or under close control, keep to paths to reduce erosion, and minimise disturbance to birds and other wildlife. Do not light fires of any description and please take your litter home. The reserve is on Route one of the Sustrans National Cycle Network and on the route of a National Trail, the Peddars Way & Norfolk Coast Path. Windswept tidelines, a maze of creeks and saltings, miles of dunes and sandspits, shady pinewoods, green pastures and marshes: the mix of habitats and the blend of wildlife make Holkham NNR a unique place, somewhere to catch your breath in a busy world.